JACKSON. New Oleans Jany 8th 1815. An emblematic portrait of Andrew Jackson, invoking his past as a military hero and especially his victory at the Battle of New Orleans in 1815. 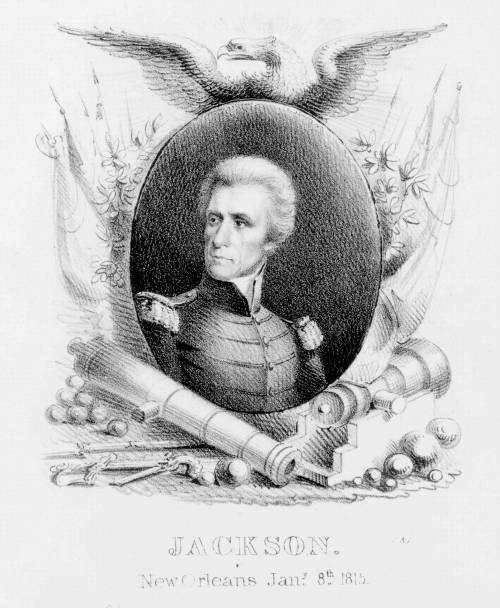 Jackson's bust portrait in uniform appears on an oval medallion surrounded by cannon, flags and other military paraphernalia, and surmounted by an eagle. The print seems to be a campaign piece, issued probably during the 1832 presidential race rather than that of 1828, when Jackson was also a candidate. The Philadelphia lithographic firm of Childs & Inman existed only from late 1830 until early 1833.